This is a first for me. I usually drink champagne out of normal wine glasses on the grounds that you can smell and therefore enjoy it much better than you can out of a finicky little uptight narrow flute. I’ve been trying to get rid of my flutes for years but no matter how many other glasses shatter, these wretched things never do the decent thing of hurling themselves into smithereens. When I moved house last week I was irritated to find that that flutes had accidentally come with me rather than going into storage. And they didn’t fit in the cupboard. And because I didn’t want them littering up the flat I took a deep breath and threw them in the bin. Let me tell you, it felt good to be rid of them. 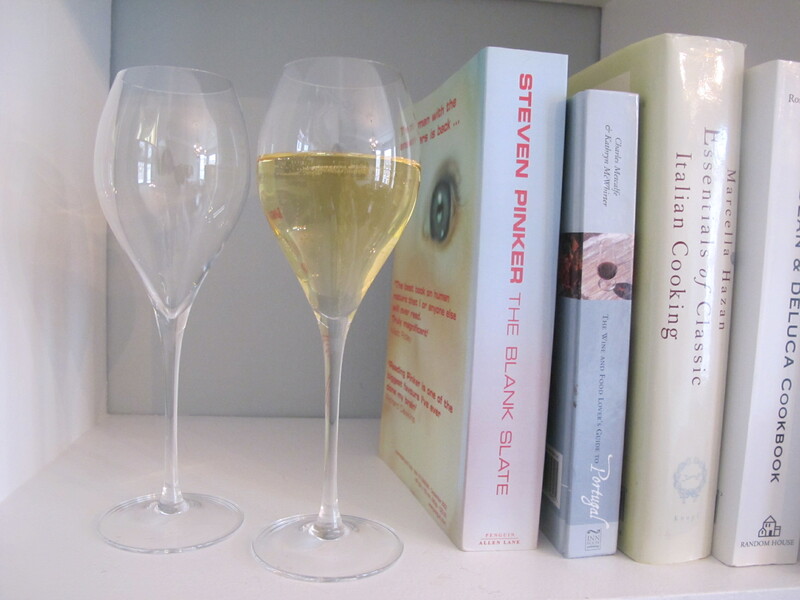 Then I opened a bottle of champagne, cast around for something to pour it in – and found two more flutes. Jesus H. Christ. Hang on, though. These were new flutes in a smart glossy white and blue Berry Brothers box (sent to me to try but I would buy them if they hadn’t been, despite the price – see below). I picked one up – and I’ve been vaguely obsessed with it ever since. Let’s get the taste thing out of the way first. These glasses swell gently outwards before nipping back in again so you can inhale and submit to the aromatic intoxication – brioche-lemon-yeast – of everything in the champagne. So they work. Big tick. Gold star, even. Still more pleasingly, they are quite simply beautiful. Think of the difference between the way you feel when you’ve been running round all day in whatever was on the bedroom chair from the day before and haven’t washed your hair, and the way you feel in heels, a new dress and a swishy blow dry (guys, you can imagine your drinking companion). These glasses are the diamond earrings, lipstick and swishy blow dry of being: extremely light, elegant to hold and with a gently curving form that draws the eye to rest on them. Drinking is a sensory pleasure but it’s not only about taste and smell. Now, the price. Oh dear. These aren’t cheap – but then neither are shoes and that doesn’t seem to stop anyone. Deep breath. £47.50 a pair. I’m not saying buy six. I’m saying put a pair on your Christmas list for decadent evenings a deux. Better still, put them on someone else’s then you still get to use them too. Finally I have to apologise for the frankly appalling photography which is not glamorous, I realise. But the glasses are. Trust me on this. And back to cheap everyday wines to help repair the budget deficit on Thursday.